The Village at Queens Harbour is an excellent condo development off Highway 17 Bypass just outside of Surfside Beach. 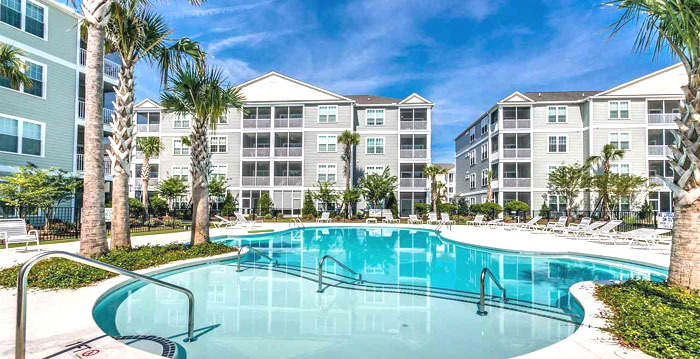 Originally built in 2012, this has proven to be one of the most popular and successful residential condominium complexes in the Grand Strand. The condos are in luxurious 4 story buildings with screened porches, elevators, and tropical landscaping. There are many ponds all over the community, so most all units have water views. 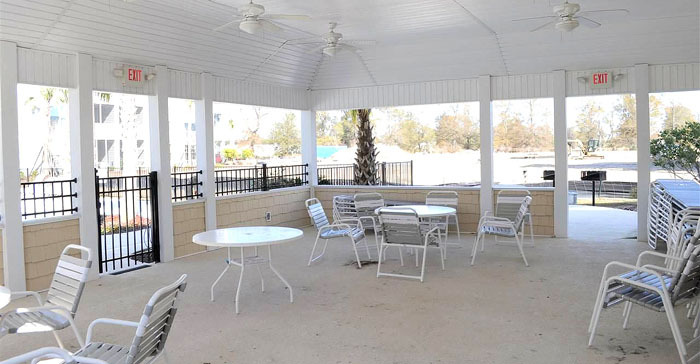 Amenities include a large resort-style pool and jacuzzi, clubhouse with a covered picnic shelter, barbeque grills, and restrooms. You will love the stunning fireplace in the sheltered area for gatherings in the cooler weather! Condos come in 1, 2, and 3 bedroom units from $80,000 to about $150,000. In 2017, another phase has been added, with slightly larger floorplans, including wide hallways and 9-foot ceilings. Many units have upgrades such as granite countertops and chef's kitchens. Choose one of the new units and pick your colors and extras! The new condos run from $100,000 to about $160,000. Kids will attend Burgess and St James Elementary Schools, St James Middle School, and St James High School. The location of Queens Harbour is another plus for these condos. You'll be close to Market Common, the Coastal Grand Mall, airport, and some of the best shopping and restaurants. It's just a short drive to the beach, too! Call us for a tour of the Village at Queens Harbour, or information about the new construction buildings. We'll be glad to show you around!